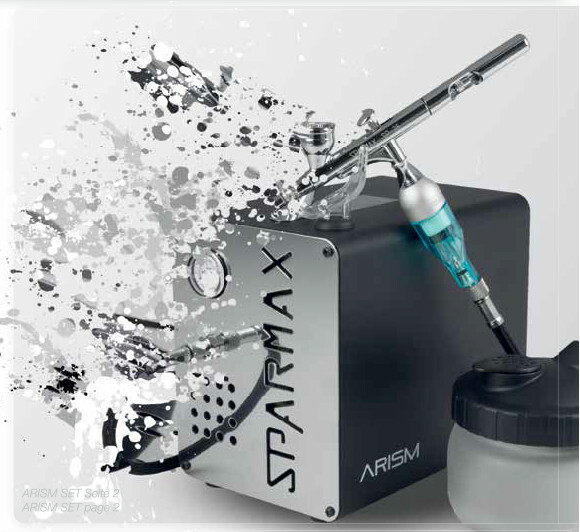 After the huge success of the limited ARISM "35th Anniversary Special Edition Kit" Sparmax now presents its follow-up and even adds a Silver Bullet on top of the new ‘ARISM kit‘. The set features the powerful ARISM AC 66hx compressor which immediately catches the eye with its elegant black design and an embossed modern logo. The compressor has a capacity of 13–15 l/min and a pressure of 50 PSI max. With 2.6 kg and dimensions of merely 19.2 x 12 x 18.5 cm, it is easy to transport and saves space when storing it. Also included: a flow system airbrush SP-35 with a 0.35 mm nozzle set and a 2 ml flow cup. The Clean Pot SCP-700, which is used for spraying superfluous color and cleaning fluids, makes all working routines safe and clean. An integrated airbrush holder will securely hold the airbrush during work breaks. Sparmax is a brand of Ding Hwa Co., Ltd., founded in 1978. This Taiwanese company produces some of the world‘s most efficient and powerful oil-less mini compressors as well as a wide range of other airbrush equipment and accessories. Sparmax compressors are maintenance free, lightweight and extremely quiet, and they are known for their exceptional quality, durability and reliability. 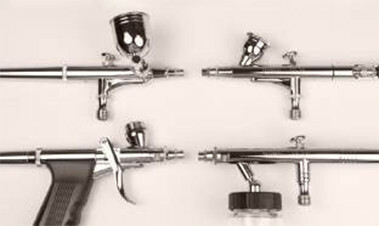 The Sparmax airbrush product line encompasses a wide range of products, from low-cost starter systems to amateurs’ and artists’ equipment to small-scale spray guns. Sparmax products are used for a variety of application areas, from art and custom painting and model making to t-shirt and pastry decoration to cosmetics, tanning and body and nail art. They offer beginners, amateurs and budget-conscious users an excellent price/performance ratio. 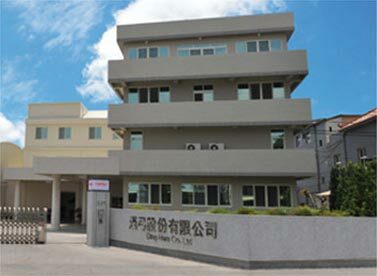 All products are manufactured in the Sparmax manufacturing facility in Taiwan which is certified according to international standards ISO 9001:2008, 14001:2004 and GMP. All compressors carry international seals of safety approval CSA, CE, UL, PSE, FDA and TÜV GS. Since 2012, selected Sparmax products have been distributed in Europe by Harder & Steenbeck GmbH & Co. KG, Hamburg, a well-established manufacturer of high-quality paint spraying equipment “made in Germany“. Thanks to their profound experience and successful positioning within the European airbrush market the German company will also provide any necessary Sparmax spare parts and accessories, directly from Taiwan.